More than the cliché image of a bridge between East and West, Turkey is better known for its eclectic mix between the mysterious and familiar. Through out history it has been touched by great civilizations, each leaving a piece behind creating a country of contrasts. In the end, Turkey’s vast landscape, filled with small towns, big cities, mountains and beaches, makes it a destination worth visiting. These Turkey Travel Tips will help you plan your next vacation. The easiest currencies to convert to TRY are US dollars and Euros; change offices offer the best rates. It is advisable that travellers carry a mixture of cash (in small denominations), an ATM card and a major credit card to avoid problems. Since 2014, travellers can not get a visa upon arrival in Turkey. Last year, a new visa system was implemented, which now requires travellers to apply for a tourist visa or “e-visa” online at the official Turkish government website. Make sure to book your hotel along the T-1 Tram for a hassle free stay in Istanbul. This line takes you to all major areas in the city, such as Sultanahmet for the Blue Mosque and Hagia Sofia, the Grand Bazaar, the Spice Bazaar, the Galata Bridge. Haggling is a way of life in Istanbul, especially in the Grand Bazaar and Spice Bazaar. Always negotiate as prices can be double or even triple the original price – rule of thumb is immediately halve the original asking price and start from there! Turkey is a country of polar opposites, the most important climate distinctions within the country are between the coast with its moderate winter temperatures and hot, humid summers and the inland areas with their extremely cold winters and excessively hot summers. In fact, the farther east you travel in Turkey, the more pronounced these extremes become with much of Eastern Turkey covered in snow from December to April while summer time temperatures in that region can peak at 45 degrees Celsius. Along with temperature extremes, Turkey's east meets west fusion mentality means that while some cities can be quite cosmopolitan, rural communities have still retained their old customs and traditions. Dress conservatively. Outside tourist areas women should be dressed conservatively (long pants, shirts with arms and shoulders covered) while men are recommended to keep their shoulders and legs covered. Travellers visiting mosques need to have their legs, arms and shoulders covered while also removing their shoes – some mosques, like the Blue Mosque, provide clothes for tourists to cover up with. Sarongs – I think we have sarongs in every packing list. From covering up when visiting mosques, being used as a towel or keeping cool on a hot night. Pack loose clothing with breathable fabric – cover up with fabric you know will breathe, especially if you plan on heading into the Sahara desert or to one of the coastal regions. Tunics are a great option as they can be dressed up or down, are light weight and offer good coverage. Kleenex / toilet paper – be prepared for squat toilets by always carrying around toilet paper and small coins with you as many public toilets are not free. Handy wipes are also highly recommended. Get lost in Istanbul – Shop at the Grand Baazar, take pictures from the top of Galata Tower, take in the nightlife in Ortakoy or sip turkish coffee. Istanbul is your oyster ready to be cracked open and devoured! Explore the other Istanbul– When one travels to this ancient city they think of The Bosphoros cutting through Europe and Asia, the Galata Tower looking towards the old city at Hajia Sophia and the Blue Mosque, but there is another side to Istanbul away from the top tourist stops and it begins with staying as a local. 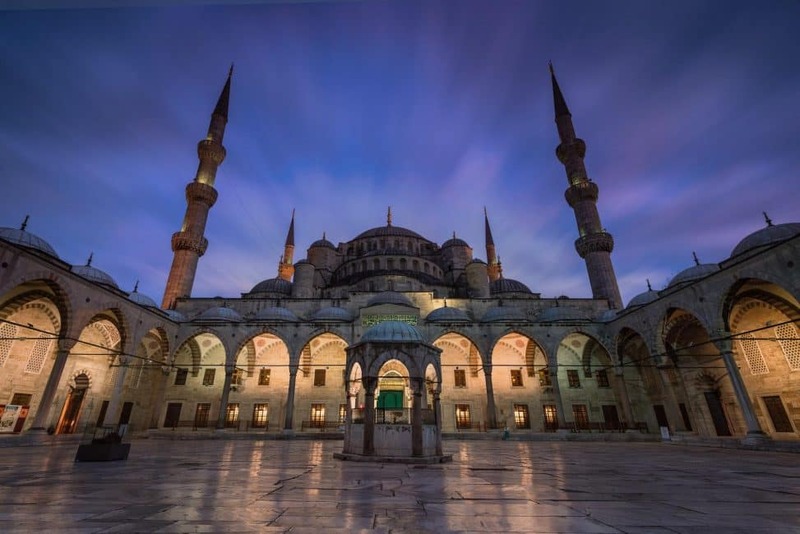 Enter the Blue Mosque – explore the outside and inside of one of Istanbul's most famous landmarks: The Sultan Ahmed Mosque, more famously known as the Blue Mosque. Go back in time at the Goreme National Park – the Goreme valley and its surroundings contain dwellings, troglodyte villages, underground towns and remains of traditional human habitats that date back to the 4th century. After you finish exploring why take a hot air ballon ride and catch the sunrise while flying over the Fairy Chimneys.